Calera Manor Nursing Home is located off of highway 75 in the small town of Calera, Oklahoma. Calera has an exciting environment for children and adults, with the safety and security that comes with being a small town. Calera Manor strives to be very active in our wonderful community in many ways. We have celebrations for each holiday as well as many birthday celebrations and cookouts in between. We hold a harvest fest in November where the resident’s family and friends joins us in eating a delicious home cooked Thanksgiving dinner. In December, our residents and staff make award winning Christmas floats and take part in the Christmas parade held in the heart of our town. We also host a Christmas party at our facility where all of our residents, family, and friends enjoy coming together to eat, talk, open presents, and take pictures with Santa. The children of our community are always a welcome sight in our facility and they come often to sing songs, play instruments, and perform dances that all of our staff and residents enjoy. Because we care so much for the children, we are always happy to sponsor not only our local schools, but schools all over the county! 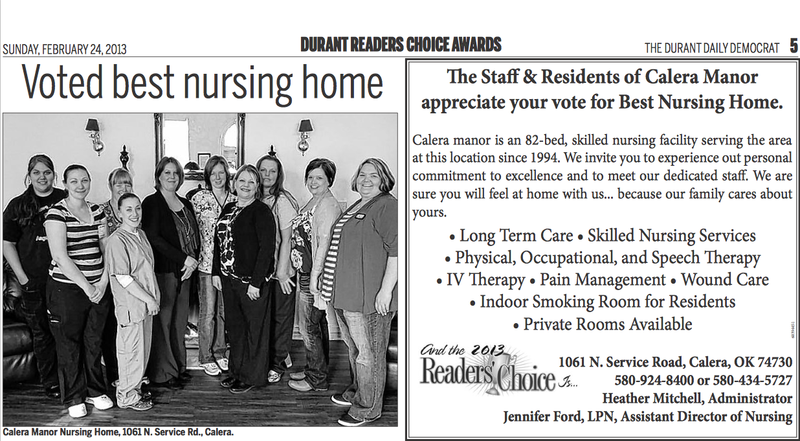 Our activity in the community has not gone unnoticed; we have been voted “The number one Nursing Home” in the area two years in a row by Durant Daily Democrat’s Reader’s Choice Awards! Calera Manor takes pride in being in such a warm friendly community where it can provide a homelike environment for its residents and their family. Is to provide a safe and secure home with enthusiastic dedication to the highest quality of care. Promoting individuality and achieving the highest quality of life. Calera Manor Nursing Home strives to create a home like environment while providing the quality of care your loved ones deserve.